T. Cook’s has been a valley staple for the past two decades. 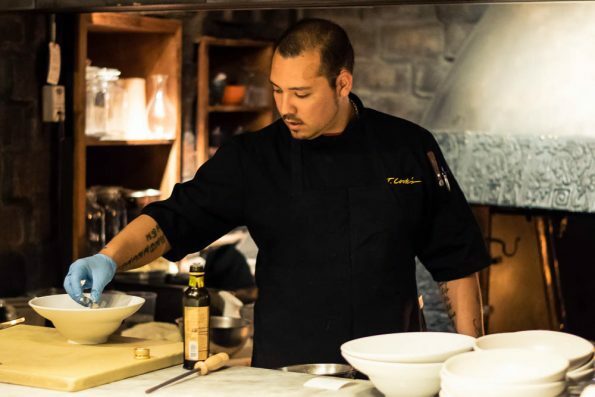 They not only have rediscovered their Mediterranean roots since Executive Chef Todd Allison took helm of the kitchen just over a year ago, but this fall, the menu dives deeper into the region’s traditional cooking methods and artful preparations. We recently were invited to come try this new fall menu. We immediately fell in love with all of their fantastic seafood. It is always difficult finding a story angle that is more than just your standard dining review. We knew going into this that no matter what we ordered at T. Cook’s it would blow our minds. Noticing all of the interesting sounding seafood on the menu, we decided to go the seafood route. The common perception among foodies is that good seafood is hard to come by in a land locked state like Arizona. T. Cook’s has accepted that challenge and proves that in their restaurant this is simply not the case. 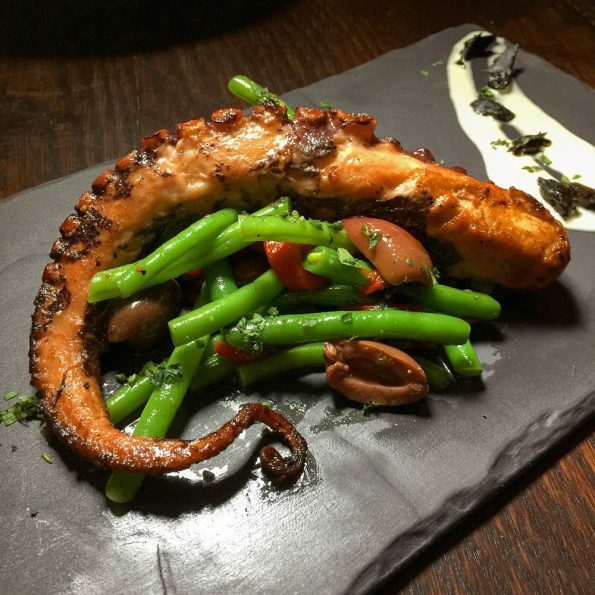 We started our meal with one of the Tapas from the Fireside Bar, The Roasted Spanish Octopus (served with piquillo pepper, haricot vert, kalamata olive, lemon aioli, and black garlic). We also tried Pan Seared Maine Diver Scallops (served with tamai farms corn, tomato saffron jam, and lobster butter) from the Small Plates Menu. Both octopus and scallops are very easy to serve poorly, however, this did not happen at T. Cooks. The octopus was tender and almost melted in your mouth. If you are scared of octopus, T. Cook’s is the perfect place to alleviate those fears. The scallops were perfectly seasoned and cooked. We enjoyed our appetizers so much that we couldn’t wait to try our entrees. For our entrees, we opted for two of T. Cook’s most popular seafood entrees, The New Zealand John Dory (served with baby fennel, cipollini onion, sunchoke, potato, and aged sherry) and The Pan Roasted Branzino (served with shishito peppers, stewed tomato, fingerling potatoes, and kalamata olive aioli). We previously had tried the Pan Roasted Branzino during our Media Preview for Arizona Restaurant Week and loved it so much we had to order the full size portion. According to Chef Todd Allison, the Branzino was the most popular item on the Arizona Restaurant Week menu. The New Zealand John Dory was a new experience all together for us. New Zealand John Dory is not commonly served in the states but is quite popular in the UK and Australia. 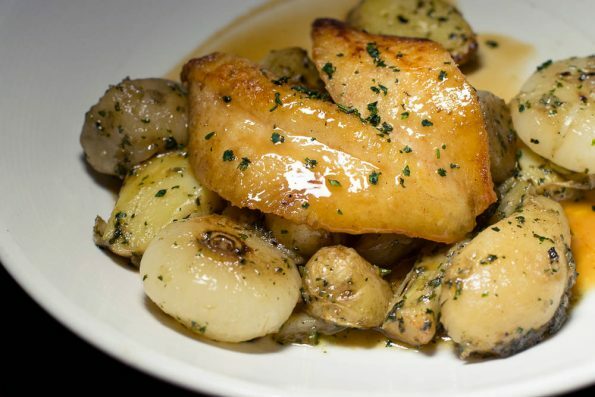 It is delicate in flavor and is similar to sole. At T. Cook’s it is served very well seasoned with a crispy outer layer (no skin, unlike the Branzino). Both entrees were perfect representations of fantastic seafood. We constantly are asked where to go for great seafood and until now we have felt very limited in our suggestions. Now we can say with resounding certainty that T. Cook’s is the unexpected yet perfect spot for a seafood date night. What are some of your favorite spots for seafood? We would love to add to our list! Leave your comments below or use the hashtag #GeekEats!